TV/Radio: MLB Network / WEEI. Doug Fister starts Game 3. Rodriguez and Porcello in bullpen for first two games. No Game 4 decision yet. Farrell said telling Chris Young he was off the roster was tough. But they needed the extra infielder. Hanley will play 1B tomorrow vs the lefty. Porcello, potential G4 starter, would be a long reliever in the first two games of the series. Farrell said Fister was chosen over Porcello for G3. Porcello was the Game 1 starter and Cy Young winner last year. Now a long reliever for at least two games. Farrell’s not messing around. There’s no simple answer, because it depends on your television service provider and your level of service. However, MLB Network does have a very easy-to-use finder that requires three pieces of information: the country in which you reside, the type of television service you have, and your ZIP code. For example, in Boston, MLB is on Comcast channels 269 (standard definition) and 914 (high definition), DirecTV channel 213, and Dish channels 152 (SD) and 152 and 9434 (HD). Verizon customers in many areas surrounding Boston can find it on channels 86 and 1530 (SD) and 586 (HD). With Thursday’s game starting at 4:05 p.m., which falls in the end-of-work/commute home hours for many, live streams may be the best choice. MLB Network’s postseason games will be streamed online for customers of participating pay TV providers through MLB.com’s At-Bat app, MLBNetwork.com/Watch, and MLB.tv. Users must log in using their pay TV account username and password. The network also has a postseason viewing subscription that includes all World Series games and select playoff games for $24.99. After Thursday’s Game 1, the rest of the Red Sox-Astros series is on Fox Sports 1. Most service providers have a channel locator on their websites. Today is the first #RedSox playoff game without David Ortiz since Oct. 18, 1999, Game 5 of the ALCS vs. the Yankees. 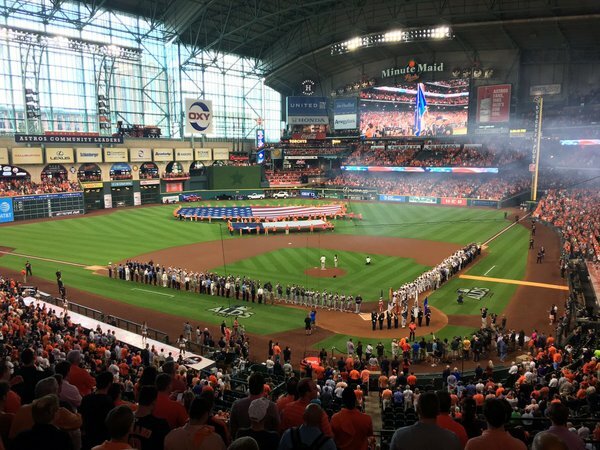 Pregame notes: Houston won the season series between the teams, 4-3. They outscored the Sox, 35-22. … The Sox have won 11 of 19 postseason games under John Farrell. … Sale was 13-4 with a 2.37 ERA in his first 21 games. He is 4-4, 4.09 in 11 starts since. … Verlander was 5-0 with a 1.06 ERA in five starts with Houston after being obtained from the Tigers. … The Sox are 90-80-1 in the postseason. Three straight day games to start this Red Sox-Astros series. Reminds me of covering Yankees vs. Brooylyn Dodgers back in '55. George Springer, upon being introduced as Astros leadoff hitter, waves the state flag. It twas not the Connecticut state flag. Let me be 1st to note that Angel Hernandez is working 1B. That menas homeplate in Game 2. He can do a lot of damage in 1st 2 games. Justin Verlander in the playoffs since 2012: 8 starts, 4-2, 1.76, 30.5% K rate, 4.7% BB rate, averaging 7 innings per start. Benintendi, Bregman, Betts, Correa, Springer, Devers. Lots of great young talent in this series. Should be fun. Here we go. Verlander opens at 94-96 mph. Kind of amazing that he's still working easily in the mid-90s in his 12th big lg season. Nuneez grounds out to third, limps out of the box, and goes down in a heap before reaching first. Nunez fell running to first. Down and being attended to. Nunez was hobbling all the way down the line and collapsed before he got to the base. He’s being carried off. 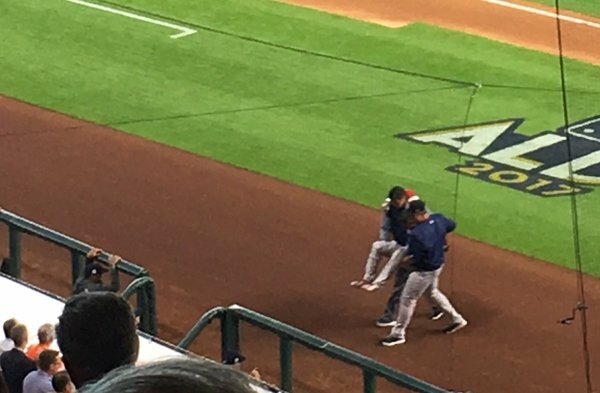 Nunez is being carried off the field by John Farrell and the trainer. Nunez is wincing in obvious pain. Have to think that he'll be removed from the roster. If so, seems likely Sox would add Chris Young. Red Sox can replace Nunez, which certainly appears he will have to be. Chris Young is certainly available. Verlander opened with 8 straight fastballs (94-97 mph) before his first secondary pitch, a change to Benintendi. 11-pitch at-bat by Benintendi, who fouled off a ton of fastballs, ends with a strikeout on Verlander's first slider of the game. Still: For Sox, having someone drive up the pitch count and navigate closer to Houston's middle relievers is significant. Nunez was running pretty well yesterday, on the base paths and off. But coming out of the box, appeared something happened. Springer tried to ambush Sale's first pitch of the game -- a 93 mph swing/miss two-seamer. Astros, following late-season efforts of teams like Toronto, are likely to be swinging early in counts vs. Sale. On a 2-2 slider, Sale leaves it up. Bregman hammers it for a solo homer. Bregman hurt the Sox last week and does so again. Sale has not had the same slider for a few weeks now. Back to back and it’s loud in here. Disastrous first inning for the Red Sox. Altuve's homer, meanwhile, showed why Houston's offense is amazing. Elevated 97 mph heater. Astros were easily MLB's best FB-hitting team.